Pablo Picasso spent several years of his youth in Barcelona and studied at the prestigious art academy "La Llotja", where his father was a professor. Mainly works from Picasso's youth but also several works from his later creative phases are exhibited at Picasso Museum. With our Picasso tour you will get to know the places in Barcelona where Picasso used to work. Booking is very easy: select the product on the right side and enter the number of participants in the tour and click on "Add to basket"
Simply indicate the number of desired Artickets, select the shipping method and click on "Add to Cart". Please note that there are no special artickets for children. During the Sónar Festival in June (June 14-16, 2018) no entry to the CCCB and MACBA is possible. Fast shipping (4.90 € shipping costs): With this option you can receive your artickets before you travel to Barcelona. No waiting time to pick them up, no waiting at checkout. You are independent of the opening hours of the issuing offices. Sending by e-mail (free of charge): Immediately after booking, you will receive a voucher that will allow you to pick up your booked Artickets at the airport or several locations in the city area (see s.u.). Tourist informations closed on 25.12. and 1.1. In April 1963 the Picasso Museum, which is located in the Ribera-district in the Old Town, was opened. 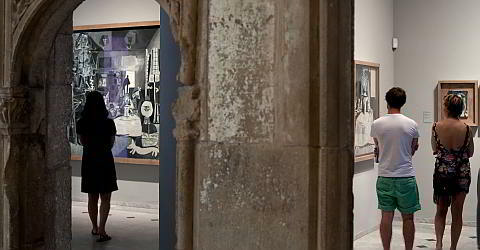 The occasion for the founding of the museum was the donation of an extensive collection to the city of Barcelona, ââby the former secretary and friend of Picasso Jaime Sabatés. To this end, the Palacio de Berenguer d'Aguilar - an old city palace from the 15th century - was converted into a museum. The permanent collection consists of over 4,200 works by the artist. The Picasso Museum exhibits mostly works from Picasso's formative years of youth, written between 1895 and 1904. The collection also includes works from later creative periods. Pablo Picasso donated the complete series Las Meninas (1957) which consits of 58 paintings, with which he reinterpreted the painting Las Meninas by Diego Veláquez to the museum in memory of his friend Sabatés. Some works were originally in various museums in the city and were collected for the Picasso Museum. Picasso's wife, Jaqueline Picasso, dedicated a 41-piece collection of ceramics to the museum in 1982. The surrounding houses were gradually added to the museum to make room for the many exhibits. The museum is run since 2014 by the Fundació Museu Picasso, which also manages the precious treasure that belongs to the city of Barcelona. The museum today consists of five Gothic palaces from the 13th to the 15th century on the Carrer de Montcada. The street itself is worth seeing, it is an important place of medieval city architecture in Barcelona. The area begins to the northwest by the small 12th century Romanesque Marcus chapel and ends at Plaça del Born at Santa Maria del Mar. The first roads outside the city walls were built in the 12th century. The c / Montcada, named after a significant family, connected the business district of Bòria with the sailing district of Vilanova del Mar, which led to the creation of the Ribera district. The street flourished from the 15th to the 16th century. It was inhabited by wealthy noble families and merchants. The whole street was declared an art historical heritage in 1947. In 1963, the Picasso Museum was first opened in the Gothic palace Aguilar (Montcada, 15). In 1970, the museum was expanded to the Palau del Baró de Castellet (Montcada, 17) and the Palau Meca (Montcada, 19). More extensions were made in 1999 with Casa Mauri and Palau Finestres. These five palaces now make up the Picasso Museum. The inner courtyards of the palaces are an eye-catcher, from there you can access the museum over an open staircase to the first floor. Pablo Picasso spent several years of his youth in Barcelona and studied at the prestigious art academy "La Llotja", where his father was a professor. Thanks to his outstanding achievements he was able to skip some classes. During this time, Picasso met many artists, with whom he made contact. His first exhibitions took place in the artists' café "Els Quatre Gats" and in the gallery "Sala Parès". He had a close relationship with the city of Barcelona throughout his life. Many people associate Picasso's painting with his abstract cubic portraits, which are quite difficult to access. The genius of his works often remains hidden. The Picasso Museum shows the life's work of the painter and sculptor sorted chronologically. The different phases are explained and you can easily understand the stylistic changes. Whoever did not like Picasso's works before the visit, might not be a fan after visiting the museum either, but at least will understand a lot. Also exciting is Picasso's relation to the city of Barcelona; with our Picasso tour, we follow in the footsteps of the world-famous artist to the places where his success story began. The Picasso Museum in Barcelona is among the three largest collections of works by the painter next to the Prado in Madrid and the Picasso Museum in Paris. Here you can book an open Picasso Tour in English with subsequent visit to the Picasso Museum. Available from 01. April to 31.Oktober 2018. Please enter the number of people you would like to book for, choose the desired date and click on "Add to cart". With the Articket you get free admission to the Picasso Museum and other well known museums without standing in line. Free admission under 18 years. Free admission on 12 Feb., 18 May and 24 Sept. and every first Sun. of a month. Free admission with the Barcelona Card and the Articket Barcelona.